Almost all Greater Manchester pharmacies now have dedicated Health Champions who can help people feel better, live longer and enjoy a better quality of life. Health Champions are specially trained pharmacy staff who offer advice and support to help people lead healthier lives. 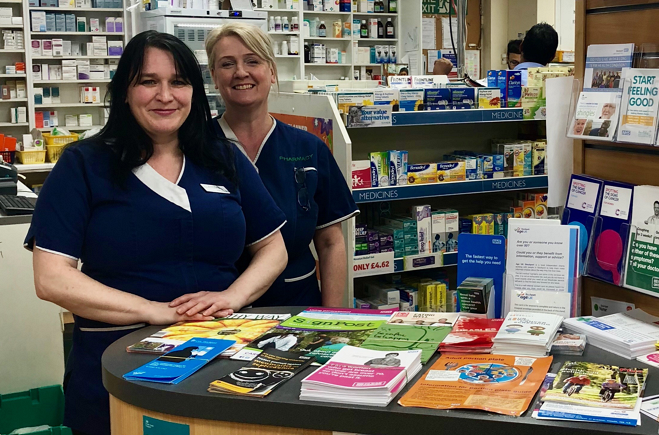 Anne-Marie Jackson and Sharon Mason, from Centre Pharmacy in Cheadle Hulme, are just two of the many Health Champions making a massive difference to people's lives. Over the last few years, Anne-Marie and Sharon have offered advice and guidance on everything from support for carers, dementia, losing weight, stopping smoking, being more active, and reducing the risk of illnesses including heart disease and cancer. They are highly-skilled at broaching sensitive issues like someone’s weight, alcohol use or mental health, and it often starts with the simplest of conversations. “People might come in for one thing, you get chatting and five minutes later they will open up and ask about another health issue or concern,” Sharon explains. “The key is listening to people and offering them the opportunity to open up if they want to,” adds Anne-Marie. “We get chatting and ask them how they’re doing today. If someone says they’re not sleeping well, for example, you can gently ask if anything in particular is keeping them awake." GM Healthcare Academy is helping pharmacies to expand the number of Health Champions by offering free training this summer. (Book here.) The two-day course (31st July & 1st August) leads to a recognised RSPH Level 2 qualification in Understanding Health Improvement. It also helps pharmacies to achieve and maintain Healthy Living Pharmacy Level 1 status, as one of the requirements is that at least one member of staff must have completed Health Champions training of this kind.